In addition to the challenge of hiring cooks and chefs to work the kitchen, waiters and waitresses are becoming harder to find. Based on a recent survey conducted by the National Restaurant Association, more than 50 percent of restaurant owners say that it is extremely difficult to find and keep good workers. The reason, simply, because of supply and demand. There is a huge need for restaurant workers, both front of house and back of house, since the U.S. Department of Agricultures reports that people are spending more time and money dining out. Americans are spending approximately 43 cents of every food dollar away from home. Michael Latour, a restaurant owner from New Jersey states, "The economy is good, and people are spending more money than ever in the hospitality industry. We're living in an area that's saturated with restaurants." Restaurant owners and managers understand that it is not so easy working in the restaurant environment. Tony Del Gatto says to work at his country club, a chef has to work six days a week, 12 hours a day, for both lunch and dinner services. That's more than 70 hours a week! The long hours are not only burdensome for both cooks and waiters, they are also taxing on their health, as they have to be on their feet all the time. In addition, workers are not willing to accept low salaries anymore. According to the National Restaurant Association, restaurant wages range from a measly $8 an hour for dishwashers and to almost $20 for bartenders. Chefs earn about $12 an hour, while waiters and waitresses get about $16 (with tips included). Christine Nunn, a restaurant owner and chef states, "People come out of the Culinary Institute of America with a lot of debt, and they're not paying it off at $12 an hour." Sadly, restaurants are unable to afford to pay more. Most restaurants already work on thin profit margins of only 4 to 6 percent. Some analysts have noted that a slowdown in immigration may be another cause. The U.S. Bureau of Labor Statistics' reports reveal that 11 percent of Hispanic workers hold jobs in the restaurant and hospitality field. Furthermore, workers have difficulty in finding accessible transport to suburban restaurant jobs. Fortunately, there are those who continue to stay and work in the fast paced environment of restaurants. Servers express that they love the bonds and interactions that make with customers, and chefs enjoy working with food too much to leave. Michael De Vincenzi, a maitre d' states, "I want to be busy. I want it to be hectic. I like the stress. It's all adrenaline." This coming April, Kevin Cox, co-owner of Bar Marco, is giving his staff a unique offer; the restaurant will ask it's patrons to stop tipping servers. Instead, in an effort to combat high turnover, all full time employees will be paid a salary of $35,000, receive health care benefits and company shares. Bar Marco will be the first restaurant in Pittsburg to pay servers by salary, however, both industry experts and employees wonder if the move actually helps wait staffs. “There’s a lot of turnover and a lot of jumping around in the restaurant industry,” Cox said. Cox and his other co-owners made the decision to provide wage stability and long-term benefits for employees, many of whom have worked at the restaurant for numerous years. Pennsylvania's hourly minimum wage is $2.83 for workers who receive gratuity, which is higher than the federal minimum wage of $2.15 for tipped workers. Historically, consumers have been expected to make up the difference in wage through tips until recently. Several individually owned restaurants have made headlines by deciding to refuse tips. As matter of fact, Cox said that the idea of bringing this practice to Bar Marco first began when an employee mentioned hearing about this practice through a national news outlet. According to James Craft, a professor of business administration, restaurants that decide to pay servers salary will employ fewer people and increase the menu prices to make up for the increase in wage. With that said, price hikes may not serve as a deterrent to consumers in expensive restaurants. Craft admitted "I go to expensive restaurants with the expectation of paying a lot of money." Rather than passing on the increase cost of business to it's clientele, Bar Marco will "add more depth to the menu and start serving dishes that require more skill to make." 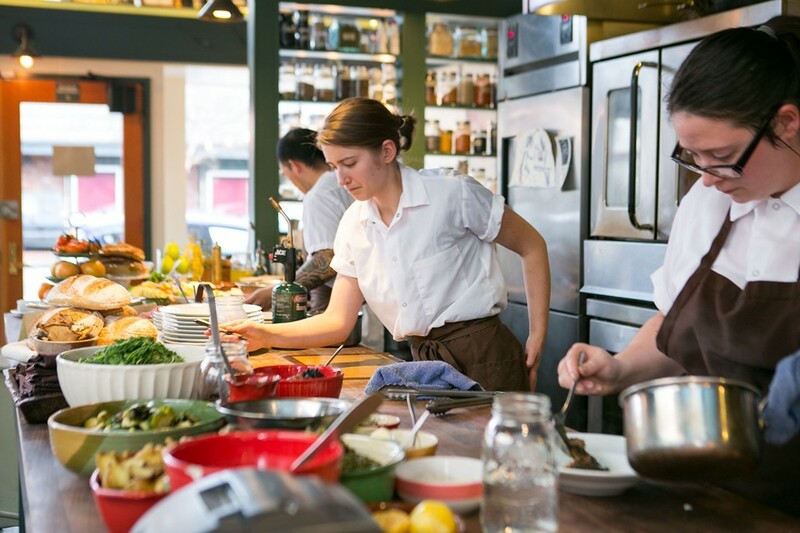 Craft predicts that a majority of the restaurant industry will still use the current tipped standard, nonetheless, some restaurants will adopt a salaried employee system. Craft also expects customers at upscale restaurants to be unconcerned with a slight increase in price if the owners decide to pay the staff minimum wage, especially if more restaurants choose to follow this trend. He believes less-expensive restaurants will stay with the standard tipping system since their patrons are used to low prices. There is also the case that some servers may not want to have a salary. Tipping is one of the most appealing traits of being a server. Some may argue that without tips, servers would treat their jobs differently: there is no incentive to work as hard. The decision would boil down to the type of restaurant a person works at. Those that work in high end restaurants enjoy receiving tips, while those who work in lower tier restaurants may opt for a more secure wage. The White House released a report titled, “The Impact of Raising the Minimum Wage on Women and the Importance of Ensuring a Robust Tipped Minimum Wage,” in March 2014. Its goal was to push lawmakers toward minimum wage reform. According to the report, servers are three times more likely than the rest of the American workforce to live in poverty. Tips have always been a hot topic in the industry and even more so recently. This topic takes center stage at NYC Hospitality Alliance's conference where leaders in the fields of hospitality, law and academia will engage in straightforward and up-front discussions on the high-profile and hot topic of gratuities. If you'd like to attend or see more details, click here. In closing, should restaurants do away with the current tipping structure and move towards offering employees long term benefits such as a salary and health benefits? If you're a server would you want a salary or would you want to continue to receive tips? Would being a salaried employee impact the way you work? Let us know what you think in the comment box below.